7-Inch Professional Knife Just $15.68! Down From $139! You are here: Home / Great Deals / Amazon Deals / 7-Inch Professional Knife Just $15.68! Down From $139! Don’t miss this amazing deal from Amazon! Get this Santoku 7-Inch Stainless Steel Professional Knife for just $15.68, when you apply the extra 20% discount coupon located below the price, down from $138.80 PLUS FREE shipping for Amazon Prime or orders $25 or more! 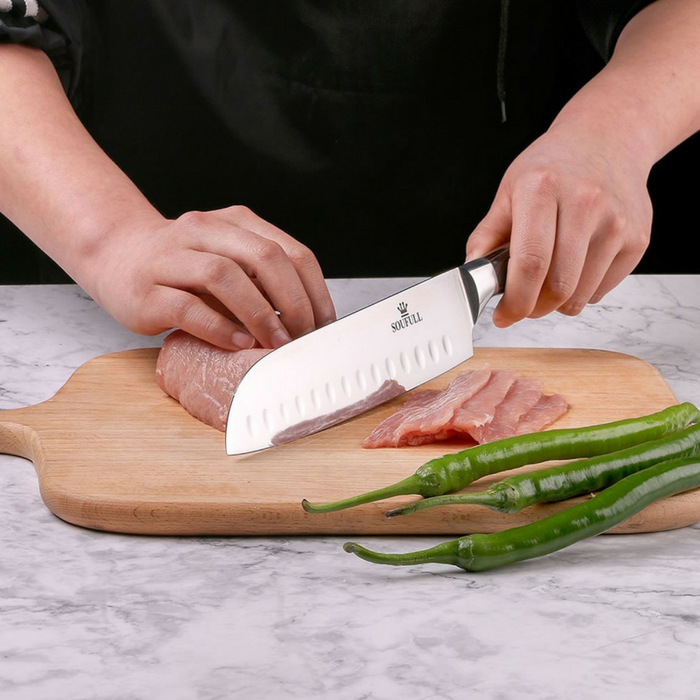 The Santoku 7-Inch Stainless Steel Professional Knife is designed to be a multipurpose knife and it’s a perfect tool for slicing, cutting and dicing. The seamless construction and smooth polished contours ensure no food or germs can get trapped. It is made of high carbon stainless steel is a premium material type which can remain the sharpness of the knife for a long time. Plus, the weight and the size of the knife feels quite balanced and you won’t feel finger numbness because of it’s ergonomic handle. ULTRA SHARP BLADE- High-carbon stainless steel blade is quite sharp and will remain this way even after cutting tough meat or removing flesh from bones. ERGONOMIC PAKKA HANDLE- The handle is made from Pakkawood, which is a material that known for its comfort, strength, and stability. Ergonomic handle can minimize any fatigue, finger numbness or aches after holding the knife for a long time. MIRROR POLISHED- Do you know the smoothness of a mirror? This knife adopts the advanced mirror polished technology gives you the perfect visual treat. ANTI-CORROSION- This 7-inch chef’s knife also uses 16-18% chrome in the blade’s metal composition. This can maintain a good brightness which will not fade or tarnish even after using it for a long time. EXQUISITE BOX- This chef knife comes with a beautiful new black gift box so it is very suitable as a gift to your relatives or friends. We updated the style of this knife, so you’ll receive the new style Santoku knife.